Are you skeptical about how renewable energy can save you money on your energy bill? You may be aware of how much it actually costs to design and install a complete solar power system on your property, whether for your home or business. At West Coast Solar, we strive to deliver the very best solar products and customer service, and we understand how big of a decision it is to make the switch to solar energy. In part one of this blog series, we discussed five ways solar power can save you money, like offering federal incentives, reducing energy bills, and Power Purchase Agreements (PPA). Here, you will learn five more ways solar energy can save you money. Your electric meter at your home or business tracks two things: your energy consumption and your energy production. Your traditional energy service provider essentially takes the net difference between these two numbers and bills you for it. When you make the switch to solar energy, you close the gap on the net difference and you could even go into the negative, which means you’re essentially sending more energy back to the grid than you’re using from it. This translates into your energy service provider crediting you for the energy you sold to them, saving you money. After you install solar panels on your home, it may increase the value of your home by up to 20 percent. This means that over time, your home value, whether you decided to sell or not, is going to go up. Although this isn’t a direct savings, it is an indirect benefit of installing solar panels on your home and producing your own energy. As a homeowner, you’re probably aware of how much your electric bill fluctuates during the major seasons in your area. The external temperature has a direct influence on how we heat and cool our homes. But what if you didn’t have to pay an arm and a leg to heat your home during the cold months? When you switch to solar energy, you will find that the energy produced will either reduce or eliminate the previous cost it took to heat your home via traditional energy. Keep your home warm. Switch to solar energy. It may sound odd at first, but you can connect your water heater to your solar power system, meaning it can be powered by renewable energy. Not only will this help save you money over time, but if you ever experience a winter power outage, you will still have warm water to take a relaxing, comforting shower. It is possible to build solar panels on your own. Although West Coast Solar does appreciate the do-it-yourself mentality, we recommend that you consider hiring an industry professional to guarantee solar panel effectiveness and longevity so you get the best savings possible. Nonetheless, if you’re looking into DIY solar panel kits, they are available, and they can save you money. We recommend contacting a solar system expert like West Coast Solar to design and install your system. 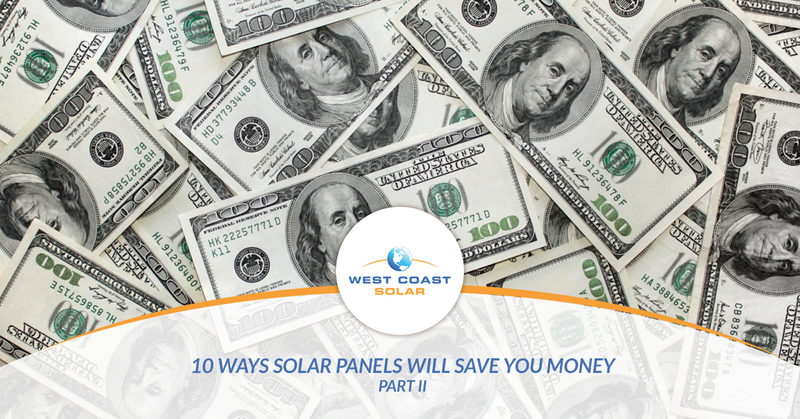 Now that you’ve learned 10 different ways switching to solar energy can save you money, what’s holding you back? At West Coast Solar, we offer more than expert solar design and certified solar installation. We offer various financing options to get you started on your solar energy project sooner than you thought was possible. Did you miss part one of this blog series? Go read it now! Otherwise, give us a call today.